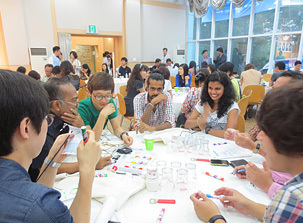 In 4-7 July 2013, the ICA Asia Pacific Committee on University/Campus Co-op held meeting and workshop in Seoul. Prof. Kokichi Shoji, then NFUCA President, served as the Chairperson of the Committee. In the regional event, students as well as co-op staff had discussions and study visit. This is the first time such event was held in South Korea by Korea University Co-operative Federation. It was a meaningful event with a lot of creativity from the students. Japan began exchanging information and experience about business and activities since 2000 with South Korean university co-ops. We started to accept co-op staff from South Korea for training and conduct study tour to Korea in 2011. In addition, we have been holding exchange seminars of student directors. The number of university co-ops in South Korea increased to 1.5 times in one year in 2012. It means that the number of students and staff who are newly involved in the university co-ops is rapidly increasing. The ICA-AP University/Campus Co-op Committee Workshop in Seoul had a special meaning within this context. The workshop theme was “Vigorous College Life and Vigorous Community Built by University/Campus Co-operatives.” There, the participants were able to learn from each other about the social background and activities of university/campus co-ops as well as other types of co-ops in each country, and learn from each other about the cultural and historical background as well as education in the participating countries. The goal of this workshop is to increase the number of “students who have global perspective, who can direct their attention to the world and social situation from their place of living,” and bolster up enthusiasm in co-op activities in each country. The welcome party on the first day was held at Literature House. There were participants from eight countries, namely Japan, South Korea, India, Indonesia, Philippines, Singapore, Thailand and Sri Lanka. The exchange of information in the welcome party was surprising. Any participant from any country was very interested in university co-ops from other countries and threw a lot of questions. Everybody wanted to make their co-op better. In particular, I was impressed by the students’ consciousness. Students from abroad seemed to be more enthusiastic in exploring what they could do for their co-ops compared than here in Japan. That attitude did not change when they were in the youth hostel. Japanese students were asked every single detail about university co-ops and Student Committee in Japan by Korean students who stayed in the same room. Thanks to the informal discussion, I was able to picture the characteristics of Japan's university co-ops and Student Committee. In Japan, we had opportunities to learn about other blocks or other university co-ops, but we never had the opportunity to learn about university co-ops in other countries. Thus, being able to hear the story of university co-ops of other countries based on the real experiences of the person was the real pleasure of this workshop. First day of visit. We had a lively exchange of views. After the opening ceremony on the second day, the whole agenda of workshop began. After having lunch together in the dining hall of Kyung Hee University, we visited Kyung Hee University Co-op. After that, we visited Kookmin University Co-op, which ended our second day. On the third day, we had group discussion on “The Role of University Co-ops in Creating A Healthy College Life and A Healthy Community” in Dongguk University. After the discussion, we visited a local co-op. We had a lot of opportunities to think from a new perspective since we could compare initiatives done by Japanese university co-ops and those of Korean university co-ops. For example, how the products are displayed in co-op store or the layout of cafeteria—these things were regarded as usual before we left Japan. But after seeing Korean university co-ops, now we could see co-op stores and cafeterias in Japan differently. Of course, it is natural that the difference is caused by the different country, system and scale, but what is important is to think about the reasoning behind them. Participants from various countries actively expressed their opinions in the group discussion. We did not consider our national background, but instead, we discussed seriously along the designed theme. I think the exchange of views based on each co-operative background suits the principle of “cooperation.” The visit to local consumer co-op was also exciting since we could understand that we created the co-op ourselves because we need it. I agree with the idea of having discussion until someone is convinced and having deep discussion if opinions differ. A genuine co-op proves its existence when the members discuss together about something they want to do. Making Korean food at dinner party. We made Jeon and Tteokbokki. There are a lot of new things we learned through participation in the ICA-AP University/Campus Co-op Committee Workshop. One of them is the power of the students. 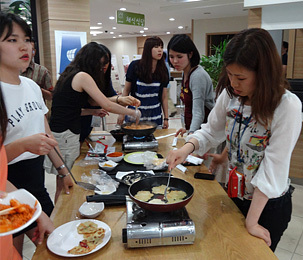 This workshop was planned and organized mainly by the students of Korean university co-ops. Seeing them worked hard, I felt that Japanese students have to keep up with them. I believe that we can create a better college life on our own. I think the activities of Student Committee of Japan’s university co-ops are something that Japan boasts about to the world. Members of Student Committee are proud with their activities and continue to expand their activities to better ones. I realized that this is the strength of university co-ops. There were a total of 24 participants from Japan. I hope that each of us will spread this experience and act correspondingly.